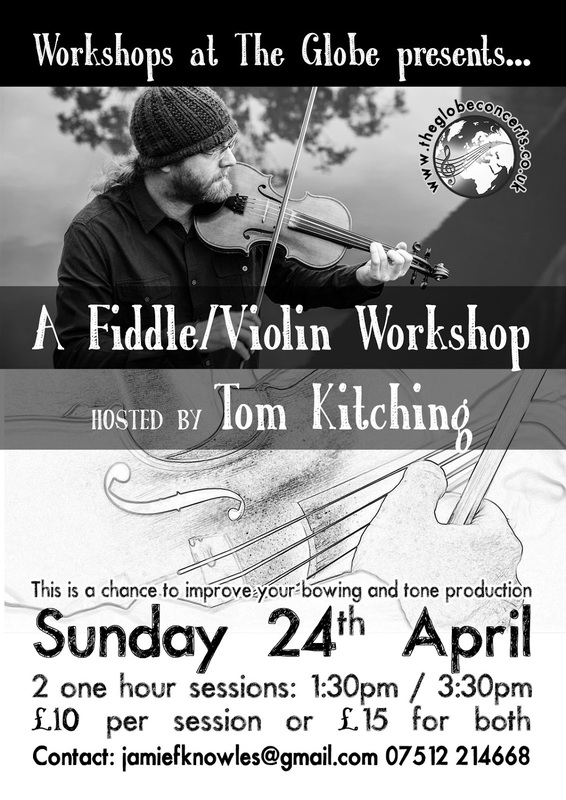 The next workshop at the globe is aimed at fiddle players, the workshop will be hosted by one of England's finest fiddle players Tom Kitching. 1.30pm till 2.30pm then 3pm till 4pm. each session will be £10 £15 for both sessions. You really only need to know one end of the fiddle from the other to join in this one. We'll look at how to simplify your technique to make playing easier. We'll explore how to give yourself options, how to produce different sorts of tone, and how to start separating what the two hands are doing. The aim will be to help each player start to take ownership of their style, and provide a bigger toolkit of sounds and techniques to work with. 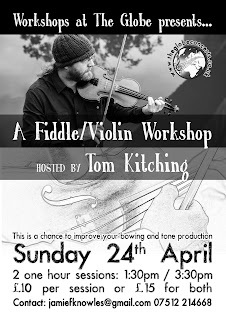 For this workshop, I will assume a reasonable level of competence, perhaps a few dozen tunes under the fingers, and a degree of session/other playing experience. You don't need to be a whizz, but you can definitely hold a tune in company. We'll explore the rhythmic side of using the bow, working on building structure and shape into tunes. We'll look at how to get crystal clear tone and good connection with the finger board. Across both workshops, there will be space to ask questions, and even dictate the course of the workshop. Whilst I have formats and ideas, ultimately, it's what's useful to the players who attend. I'm open minded and want to help!